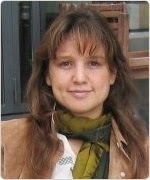 Zeynep Tufekci, pictured, calls herself a "techno-sociologist." She has been talking about some important things. One of her "TED talks" discusses online social change, and is well is worth watching. It reinforces my own thoughts on this topic. Tufekci has also made a rather scholarly paper available online, in which she talks about how "big data" and "computational politics" may be undermining our democratic system. I have assigned the paper to the students who are taking my course at UCSC on "Privacy, Technology, And Freedom." Feel free to read that paper, too! Tufekci relies upon, and expands, the analysis presented in The Victory Lab, a book I have written about on this blog, and that Politico calls "Moneyball for Politics." If we want a politics responsive to real people and their real concerns, we are going to have to meet face to face, and go from there. "Clicking" our way to democracy and political effectiveness is a dead end. In fact, it's a trap. That "computational politics" that Tufekci is talking about is a politics that takes your "likes" and turns them against you. The more the the "clickmasters" know about what you "like," the more they will use that information to manipulate you. As of last year, Facebook was processing about 2.5 billion pieces of content, 2.7 billion “like” actions, 300 million photos and, overall, 500 terabytes of data every day.